Schematic diagram showing the operation of a simplified turboshaft engine. The compressor spool is shown in green and the free / power spool is in purple. ^ Warwick, Graham. "F-35B - The STOVL Challenges Archived 2014-04-13 at the Wayback Machine" Aviation Week & Space Technology, December 09, 2011. Accessed: April 10, 2014. ^ "Mi-26 HALO" fas.org, September 21, 1999. Accessed: April 10, 2014. ^ "About the GE T64" BGA-aeroweb, May 17, 2012. Accessed: April 10, 2014. 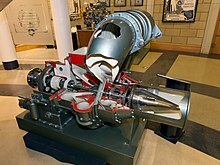 Wikimedia Commons has media related to Turboshaft engines.